Top- the 25 Wyandot players who participated in the "Great Relay Race;" left - Johnny Florio driving off 1; right- Mrs Thurston Emmons putting out on 9; bottom left- Glen Bishop holes final putt on 18; bottom right- Tom Dempsey's automobile careens around a bunker to deliver Mrs. Emmons to the ninth green. As he had done hundreds of times, Johnny Florio eyed his impending tee shot on Wyandot's rather claustrophobic first hole. The 403 yard par 4 presented such a severe dogleg left that a hitter of Johnny's length would normally club down to a spoon (3 wood) or cleek (four wood) to keep from driving through the fairway into the trees on the right. 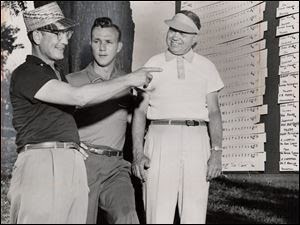 Wyandot's professional Francis Marzolf, the man who had selected Johnny to find the fairway on the course's scariest tee shot, looked on with full confidence he had made the correct choice. 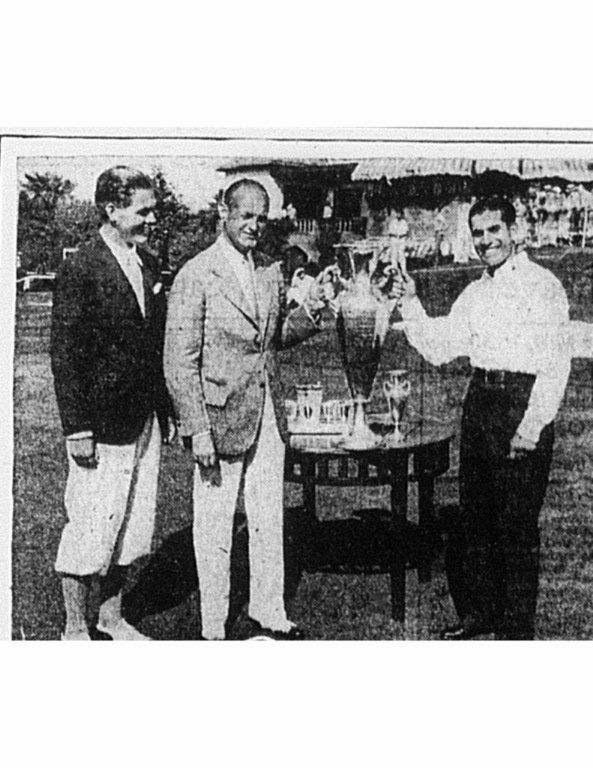 After all, Johnny Florio had been the victor in the 1932 Ohio Amateur championship the previous summer at Akron's Portage Country Club. In order to save every millisecond, Marzolf instructed Johnny to start his backswing the moment that official timer George Trautman (and Columbus Redbirds baseball team president) gave the signal that the "Great Relay Race" was underway. Francis had organized what was sure to be a chaotic relay race in order to publicize the club, and hopefully attract some new members. How fast could a round of golf be played by 25 of the club's members by positioning them so there would always be someone ready to strike the next shot the moment the previous one came to rest? Once a golfer played the shot, he (or she would be hustled by automobile to play another shot on a subsequent hole. The ball was to be relayed in this fashion from shot-to-shot and hole-to-hole. In masterminding this melee, Francis figured that in addition to playing speedily, his golfers needed to play well. Time wasted searching for balls in the woods would doom the relay team's effort. Thus, he would station his best players like Johnny, Glen Bishop, Mrs. Thornton Emmons, and southpaw state champ E.G. Livesay in position to hit the treacherous shots where misses would be the most time-costly. So when George Trautman hit the stopwatch and yelled, "Go!" Johnny Florio swung into action. However, at the top of Johnny's backswing, the game plan, so carefully thought out by Marzolf, went awry. Sportswriter Lew Byrer had been delegated the task of firing a shot to alert the other relay team members that the race had begun. Unaccountably, he pulled the trigger in Florio's mid-swing, and the resounding discharge caused Johnny to flinch thereby snipe-hooking his ball deep into the woods. With the clock ticking, Johnny had no choice but to re-tee. This effort was better, but a precious 20 seconds or so had been irretrievably lost. The second hole featured an even worse comedy of errors. 1930 state amateur champion Glen Bishop pushed his drive badly into the ravine. Thornton Emmons, poised to hit the second shot, mistakenly thought that the ball had entered the ravine close to the tee, so he began sprinting back toward Bishop. Glen, realizing that Thornton was confused, began running to where be believed the ball had disappeared. In their mutual anxiety, the two actually passed each other. Emmons finally found the ball, and hurriedly made a poor shot just 50 yards ahead. Fortunately, the miss stopped right at Bishop's feet from where he remarkably hit his driver (still in his hand) off the deck to the edge of the green. Another mix-up occurred on the fourth hole when nobody showed up to hit the second shot. Bishop, riding by en route to the fifth tee, jumped out of a car driven by Tom Dempsey, and played a fine spoon to the green, With Bishop now unavailable, Dempsey sped to the 5th tee with only his putter in tow. After Mrs. Emmons holed out on 4, Tom improvised brilliantly by smashing his "putt" 170 yards down the 5th fairway. From there, all proceeded more or less according to plan until the 10th tee. Livesay was late in arriving, so L.W. St. John, Ohio State University's athletic director (and the namesake for OSU's St. John Arena), grabbed a brassie and smacked a great shot down the middle. Briefly, the team got on a roll; Don Dutcher rolled home a 15 foot birdie putt on 12, and Bill Hinchman chipped in for another bird on 13. Whether it was the blood rushing to his head after that sensational chip, his mad dash to the 14th tee, or the fact that the pro Francis Marzolf was impatiently waiting to play the next shot (hopefully a putt), Hinchman made a mess of things by promptly dumping two balls in the water on the short picturesque par 3. Then on 15, Mrs. Emmons putted the ball before it had stopped rolling, resulting in a four- putt. One final snafu involving the club's two best players closed the round. Florio's second shot on the home hole finished off to the right, and behind Dempsey's automobile which had brought Bishop to the green ostensibly to hole the final putt. Now in full Keystone Cops panic mode, Bishop struck his pitch before Dempsey had cleared the car from the path of the shot. The ball banged into the vehicle and was hanging on the running board as Dempsey was driving away. It finally dropped off, and Glen ultimately holed out in 7. Whew! 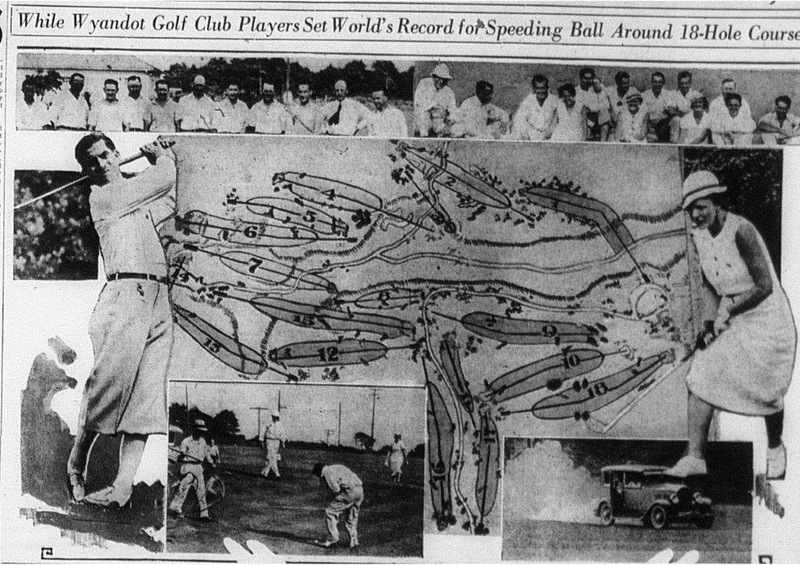 Despite several hilarious miscues, the Wyandot players had established a new relay world record, having completed the circuit in 20 minutes and 41 seconds, and carding a credible 89 in the process (according to the internet, the current golf relay world record is in the neighborhood of 8 minutes). This madcap event made the first page of The Citizen's sports page on July 23, 1933, and was widely reported outside Ohio. 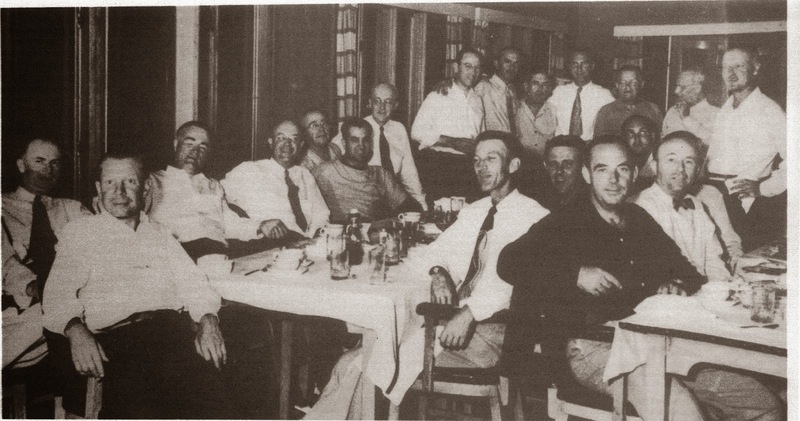 The club devised other thoughtful ways of furthering camaraderie among the members and enriching the golfing experience. Members living in Delaware formed a team to play competitive matches against residents of other surrounding communities. Another brainstorm involved a match between the two sides of the men's locker room with the losing side buying dinner. Wyandot's treasurer, Bill Margraf, inaugurated a third new event- the "Board of Directors' 72 Hole Medal Play Handicap Tournament," designed to encourage more members to play in competition. It was contested over four successive weekends. The entrants were given the choice of playing their tournament round either Saturday or Sunday of each weekend, provided they designate in advance which day's round was to count as the tournament score. Margraf did not have far to travel when visiting the club. His home was located adjacent to the third fairway. It seems that Bill must have been engaged in a golf course romance because he married one of the club's female members and best players, Chester Skees. They formed a formidable duo in the mixed competitions. The Margrafs once teamed to shoot a gross score of 74 in the alternate shot format. Bill, a single digit handicapper, also contributed to Wyandot's men's team's ongoing success in interclub completion. His service on the board was also of great benefit to the club. He was a confidant of the Kaufmans, having managed a Marble Cliff Quarry division for a number of years. Bill ultimately made a career in golf. He served with distinction for 20 years as the executive secretary of the Ohio Golf Association, responsible for organizing the important statewide events. As a posthumous tribute to Margraf and his wife, the local Columbus District Golf Association conducted a mixed event called "The Margraf" for many years. "Crowe played the guitar, Frambes the uke or mandolin, Margraf could sing tenor, baritone, or bass as the occasion demanded. In from a round of golf, they'd start, "I Want a Girl," "Down By the Old Mill Stream," "When You Were a Tulip," "There's a Long Long Trail and all the others each got their evening workout. Those who were in the locker room before joined in, and so did the others as filed in off the course. Some might be in the showers, others shaving, but the songs went on. It was one huge choral society." Like Bill Margraf, former South High coach Herb Bash also made his living in the golf industry. Herb and his wife owned the Berwick Golf Course, a public facility located on the city's southeast side. Herb helped grow the game at Berwick by conducting numerous golf clinics for the city's youths. 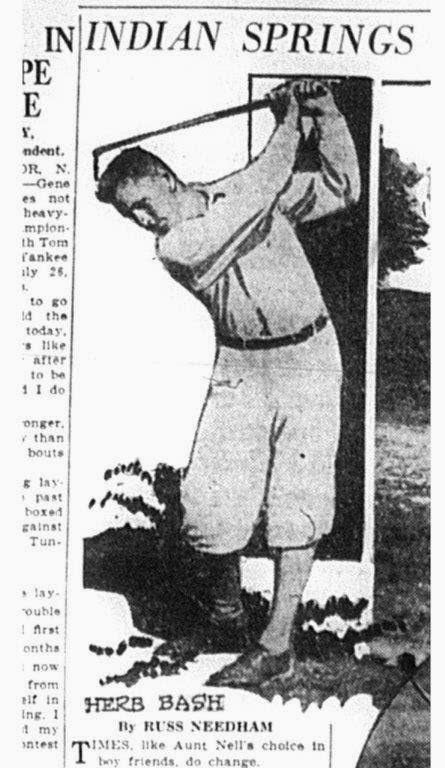 Shortly after joining The Elks' in 1928, Bash, in partnership with Bugs Raymond, opened another golf course- Indian Springs, opposite Henderson Road on the east side of High Street. Herb later added the "Bash Driving Range" in Dublin to his collection of entrepreneurial golf activities. Like many of his compatriots at Elks'-Wyandot, Herb Bash could golf his ball. Prior to joining The Elks', he won Dublin Road's club championship. Herb was also a mainstay of the 1932 Wyandot golf team which won the inter-club championship. There were a myriad of competitive outlets for Wyandot's better players in the 30's. The Columbus Citizen's Private Golf League, established in 1936, featured inter-club matches every third Sunday. The eight-man teams haled from Scioto, York, Brookside, Columbus, Granville, and Wyandot. The Citizen awarded a trophy each year to the league's champion. The Columbus Golf League provided another battleground for good club players. The KingTaste Products team was a perennial champion. Johnny Florio was one of the league's all-stars. In 1932, Wyandot served as the home course for the Ohio State Buckeyes. OSU's athletic director, Lynn St. John, a valued Wyandot member, was instrumental in orchestrating this arrangement. 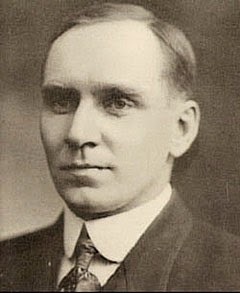 St. John also named Francis Marzolf the team's coach that year, succeeding George Sargent. Johnny Florio, now 23 was still a varsity player, so Wyandot members were provided an opportunity to cheer their favorite son in Western Conference action. Unfortunately, depleted finances forced OSU to temporarily suspend the golf teams' activities in 1933, and the golf team drifted away from the club. 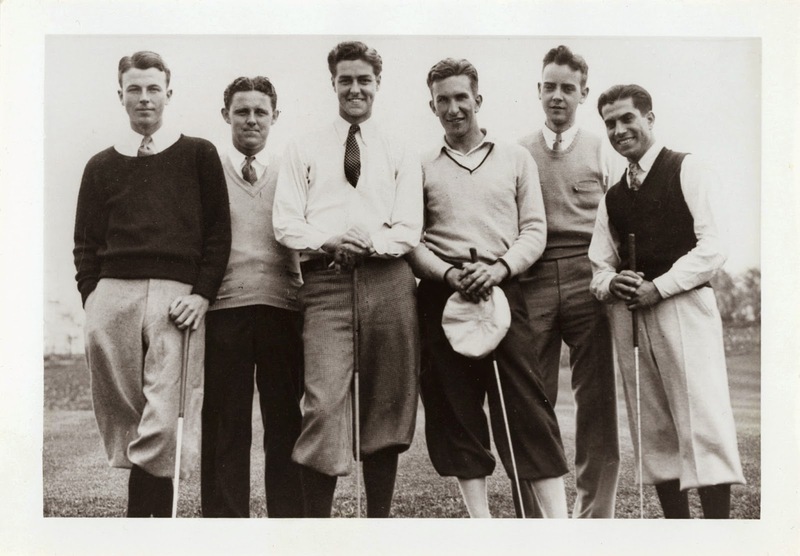 Coach Francis Marzolf (2nd from left) with the 1932 Ohio State golf team. Bob Kepler (3rd from right) and Johnny Florio (far right) join him. Not every member was a star golfer. Cy Watkins was perhaps more typical. Cy had no time for golf as a young man, having been immersed in building his business, The Watkins Printing Company. In his 40's, Cy's business interests had progressed to the point where he finally could afford some leisure time. He took up golf, enjoyed it, and joined Wyandot. However, Cy started golfing a little too late in life to develop into a first-class player. The same could not be said for his teen-age son Dwight. The young boy took full advantage of the opportunity the course provided, playing and caddying whenever possible. After Wyandot closed down, both father and son joined Brookside. Son Dwight raised his game to a level good enough to win Brookside's club championship! At age 88, Dwight still consistently shoots under his age. When he outdistances his far younger opponents off the tee, he invariably turns to them smiling, and facetiously remarks, "Great Drive!" Dwight has nothing but fond recollections about Wyandot. "It was a special place, full of beauty, and loads of golfing challenge." When the members finished their appointed rounds, they found other diversions at the club. With prohibition ending in 1933, the bar officially opened for the first time. And to paraphrase Claude Rains character in "Casablanca," you are probably not "shocked to learn that gambling was going on" at Wyandot. Ellen Marzolf Hallerman recalls two slot machine across from the bar. Ellen still remembers the time her father Francis gave her and brother Frank nickels to try their luck. Sometimes, higher stakes were played for. Legend has it that a lucky member won enough cash shooting craps one night at the club that it enabled him to buy a new sedan! With improvements to the facilities, the club also became a hot spot for fraternity and sorority functions and dances when those organizations were looking for an off-campus venue to hold events. Yes, Wyandot was a hoppin' place in the 30's. With the country still emerging from the depression, country clubs had to tighten their belts, and Wyandot was no exception. But the members did not let enforced frugality stand in the way of a good time. Despite the gathering of storm clouds in Europe, most folks stateside retained an optimistic view of the future. And while Wyandot may not have possessed quite the social standing of Scioto or Columbus, it definitely had its own charm. Wyandot was the fun place to be! Acknowledgements: archives of the Columbus Metropolitan Library, Columbus Memory. Scripps-Howard Newspaper/Grandview Heights Public Library/Photo.org collection; http://www.photohio.org Tom Marzolf; Ellen Marzolf Hellerman; Dwight Watkins; Betty Huber; archives of Columbus Citizen and Columbus Dispatch all of which are housed at Columbus Metropolitan Library. Next Chapter 15: "The Pro's Pro"